Polyphenols in Human Health and Disease documents antioxidant actions of polyphenols in protection of cells and cell organelles, critical for understanding their health-promoting actions to help the dietary supplement industry. The book begins by describing the fundamentals of absorption, metabolism and bioavailability of polyphenols, as well as the effect of microbes on polyphenol structure and function and toxicity. 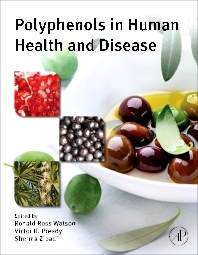 It then examines the role of polyphenols in the treatment of chronic disease, including vascular and cardiac health, obesity and diabetes therapy, cancer treatment and prevention, and more. 5 Polyphenols Extracts: May the Rings Make the Difference to Fight Aging? 3 Skin Applications of Polyphenol Nano-Formulations: Enhancing Benefits? 4 (Nano-)Polyphenols: Potential for Tissue Inflammation and Repair?